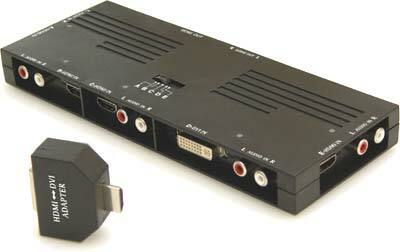 Overview : A 5 in 1 video selector: 4 HDMI and 1 DVI input with 1 HDMI and 1 DVI output. Also features a unique extra audio plug and socket to connect to a loudspeaker. Play any HDMI or DVI source at 1080p on your compatible TV or PC with this plug and play selector with unique features like being able to connect to an amplifier and extra speakers for perfect sound matching the quality of the image, or the included DVI-HDMI converter. Quality/Usability : The XCM HDMI/DVI Crossover Selector is designed to allow you to toggle between four (4) HDMI and one (1) DVI. If you havent noticed, as more and more devices such as HDTV's, HD cable, satellite boxes, DVD players (Blu-Ray and HD-DVD), they are now incorporating HDMI and DVI. As more people get into high def, they will have more and more devices but are only limited to a certain amount of inputs on their devices. The selector is made of durable plastic. The top of the Crossover Selector has five switches (4-HDMI, 1-DVI). On the right and left side is a HDMI IN and Left and Right Audio IN. The front has two HDMI IN and L & R Audio IN as well as a DVI IN and L & R Audio IN. The back has a DC IN to plug the AC adapter into and a HDMI OUT and L & R Audio OUT. This is connected to your TV/monitor. Setup is plug-and-play. Simply plug in the cables, select the port and you're good to go! If you have more than one device that uses DVI, you can also use those DVI devices so as long you use the appropriate adapter. If your monitor uses DVI, the Crossover Selector comes with a DVI to HDMI adapter so you can connect it to the device. When a device is in use, an LED is lit up to let you know which one is in use. Testing with a Sony PlayStation 3, XBox 360 Elite and HD-DVD Player and a Dell PC that uses DVI, all devices switched without a problem. I did not notice any quality downgrade. Even upconverted DVDs worked without a problem. What makes the Crossover Selector stand out from some of the HDMI selectors is that you are able to connect audio cables to the selector. Conclusion : Overall, the XCM HDMI/DVI Crossover Selector worked flawlessly. The ability to connect audio cables to the selector and to a home theater system is a big plus in our books. It would have been nice if it included a remote that lets you switch between the devices instead of having to manually switch to the device you want to use. Those who live in the US or outside of Europe will need to power adapter converter that will fit their outlet. The included power plug has three prongs.